It's Going To Rain — Raining Color With Pamela Froman! Posted on October 23, 2012 at 2:04 pm. You know that song “It’s Raining Men”? It’s happy, it’s fun — right? Well, that’s the song that plays in my mind when I look at this picture — except that it’s ‘earrings’ and ‘color’ instead of ‘men’. 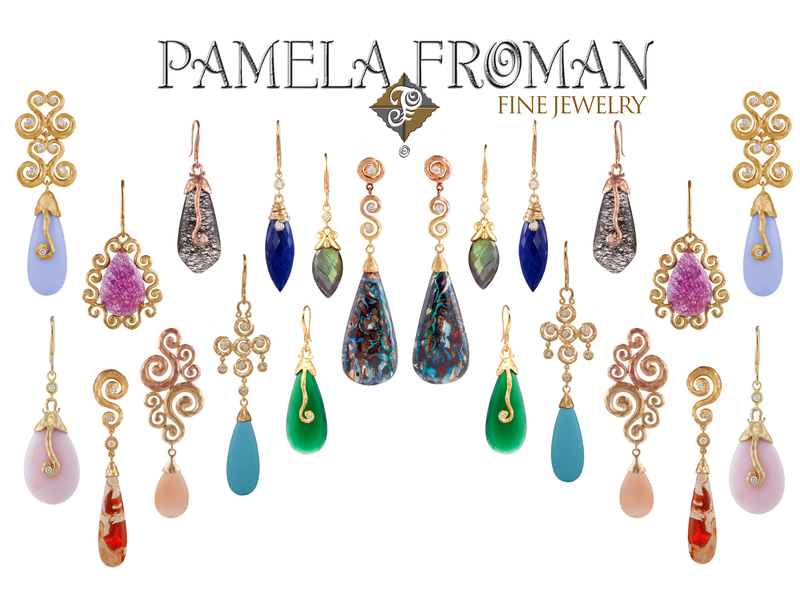 I am so glad that our friend Pamela Froman is making a return visit to Max’s with all of her latest and greatest, including so many of these beautiful stone earrings. If big stones aren’t your thing (think “different strokes for different folks” — clearly, I’m into an old song mood today! ), there are so many things to love about Pamela’s collection. Some people are drawn to her work because of the heavy pounded texture on her gold that she calls “crushed” or the way she seamlessly blends multiple colors of gold – yellow, white, rose or green – into the same piece of jewelry. Whatever it is that catches your attention, one thing is certain – Pamela’s jewelry is unique and stunning. I hope that you’ll stop by to meet Pamela and see her collection — the show is Friday, November 2 (11-7), Saturday, November 3(10-6) and Sunday, November 4 (noon-5).